You’ve found the perfect restoration piece. You picked the most fabulous color. You sand. You prime. You paint. You sand. You paint again. You poly. You pat yourself on the back! 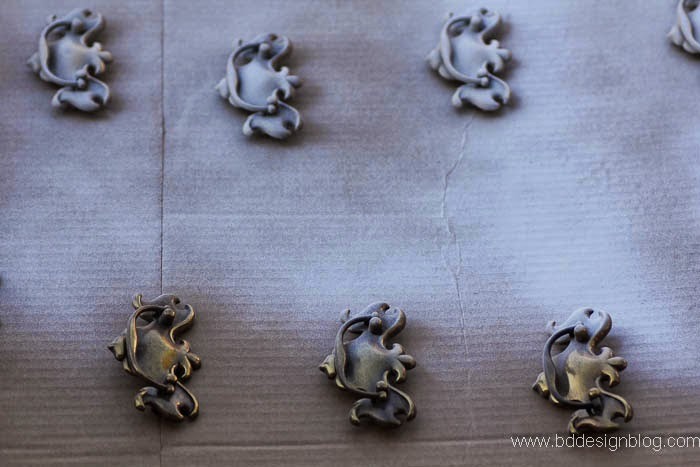 The next step of dressing up your hardware is either going to MAKE or BREAK the look of your piece. 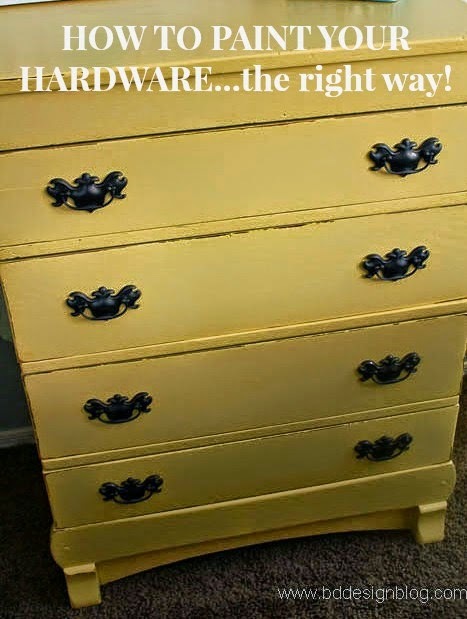 If your hardware is unique and adds to the piece…LEAVE IT ALONE! There have been many dressers or desks that I’ve just left the draw pulls as is and loved it. 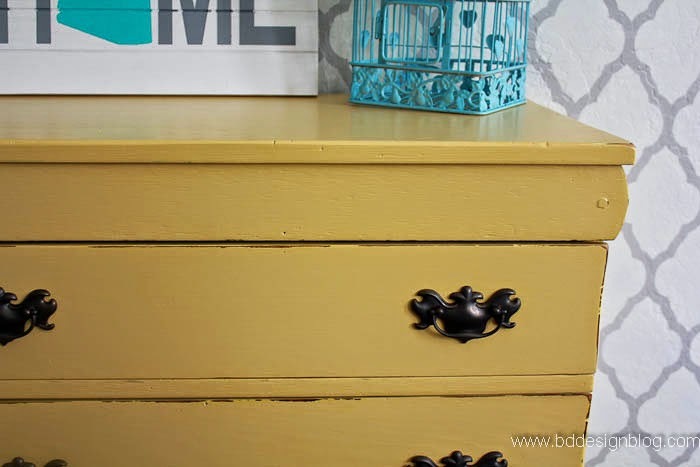 However, a fresh coat of paint on some drawer knobs can really make your piece look so much better! But the worst thing that can happen after you have spent HOURS refinishing your piece is that you mess up painting the hardware. Trust me, I’ve been there and done that, so I get how frustrating the last step can be. I need to do a blog post about the easiest way to get the paint off your hardware. First, take any multi-purpose cleaner and clean the hardware to remove any dust or what not. 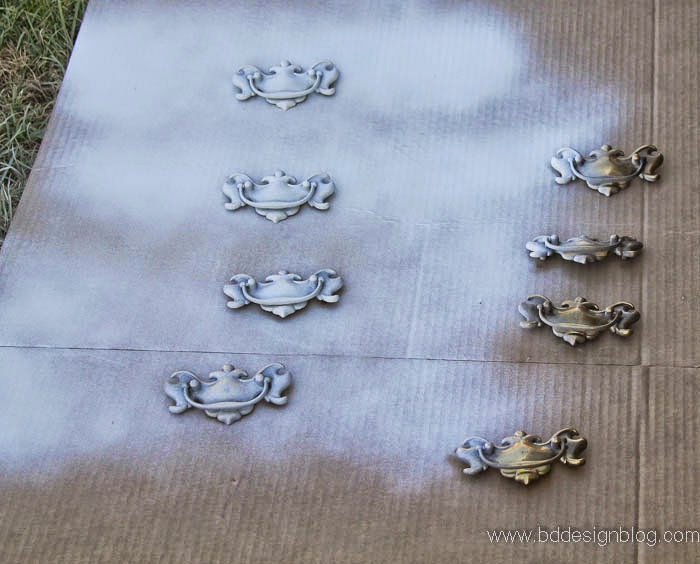 After you dry them off, place them on a cardboard box for the next step….PRIMER. Primer is the key!! And when it says to shake for 3-5 minutes, shake that can for 5 minutes!! You don’t want to take the chance that the primer comes out uneven or blotchy. Apply many light coats of primer until you get 100% coverage. 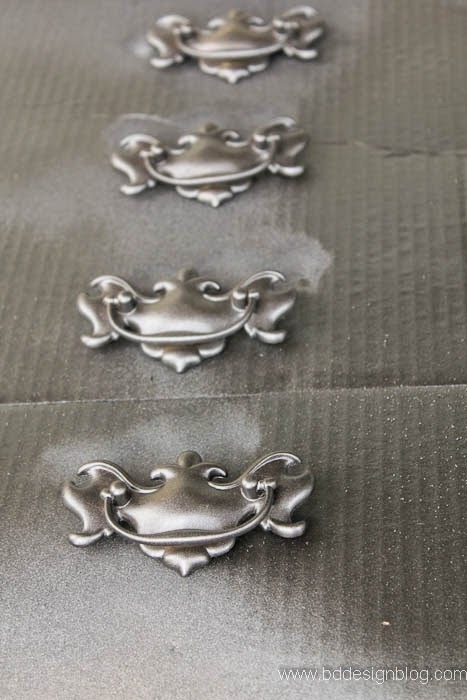 After the primer dries, apply your spray paint the same way. Many light coats until covered. I use oil rubbed bronze on most of my pieces. It is the best color! After the paint dries, spray those suckers with poly so that they don’t chip or get scratched. I just have to tell you that this yellow is the most perfect yellow color ever. It’s like butter. If you want to know the custom color code for this buttery yellow, check out my Instagram! I put a picture of the lid on there. Thanks for stopping by!! Find out why ZINSSER SHELLAC is a miracle worker. What a pretty piece! The hardware looks great. We just re-did an old dresser for our nursery. http://goo.gl/ZprI9p I almost changed out the hardware but decided to leave it as is. What do you think? If I painted it, what color should I use? Thanks! Heather, thank you for stopping by!! I just looked at your piece and it is gorgeous! You did a great job. 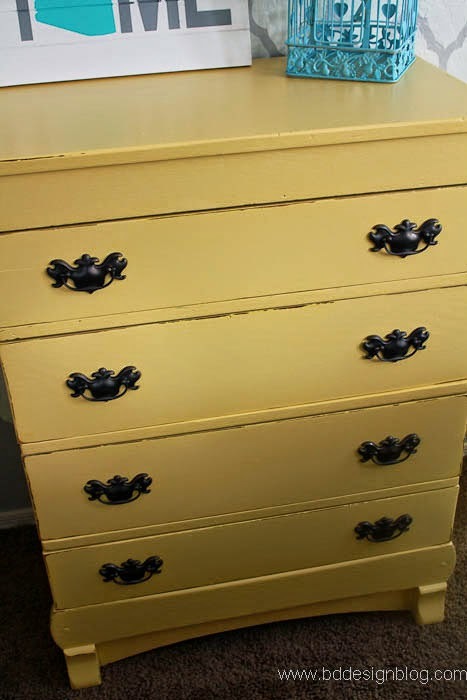 If it were me, I would paint the hardware either the oil rubbed bronze that I used for this dresser. 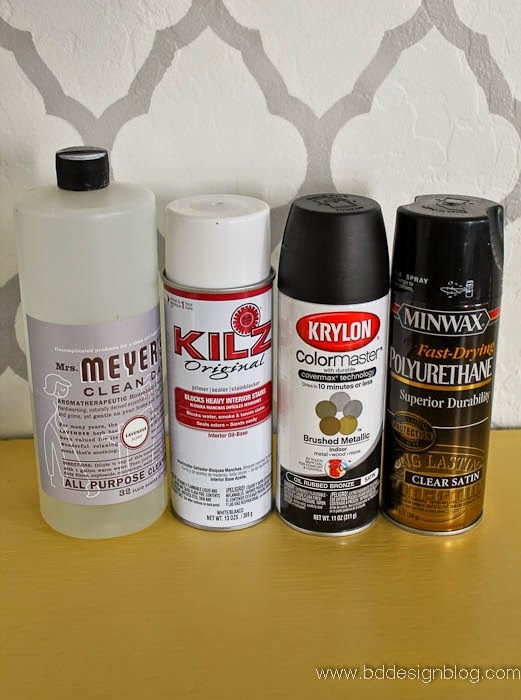 Or Rustoleum has a really pretty shiny gold spray paint. Those would be my 2 choices. Good luck and let me know what you decided to do!!! Beautiful piece, Brandy!! That color is amazing!! <3 Thank you bunches for linking up and partying with us! Pinning this! That looks amazing! I spray painted some hardware awhile ago, but didn't follow those steps. It definitely hasn't held up as planned. Now I know why!! Jenny, thank you SO much for letting me know about the picture issue. That is SO weird! 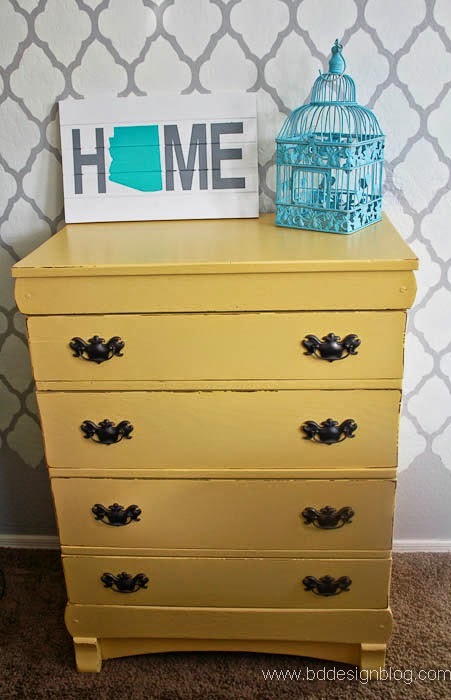 I'm going to look into it right now and try to figure it out but in the meantime…here is the pinterest link from my BD Design Blog pinterest board for the yellow dresser. 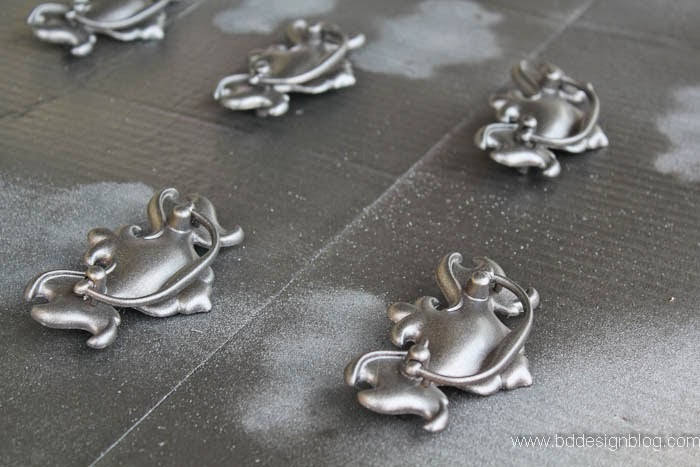 Great and helpful tips on achieving success with a sometimes tricky spray painting project! Thanks for sharing! Becky @ Flipping the Flip. Looks Amazing! I now have an urge to paint the hardware in my house! LOVE the hardware on this piece. 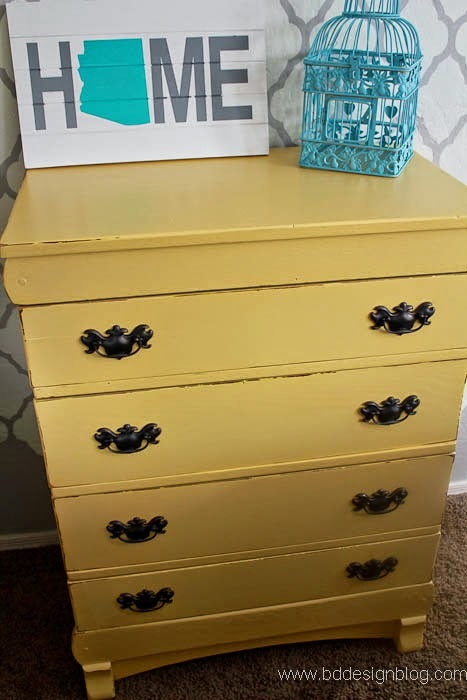 That dresser has such a pretty shape! Thanks for the tips! I'm pinning for later. You are so right about the hardware making or breaking a perfect piece of furniture! I love the yellow and the contrast!